Lenin turned Russia into autonomous republics so not one ethnic group will have too much power; Communist theory denies the existence of race but the adherents flip flop to favor one group over another. Rules for Radicals by Saul Alinsky borrowed his approach to identity politics. The first Ukrainians were Carpathian Russians in Austria-Hungary who denounced Orthodox Christianity for Roman Catholicism in 1893, and then when the Ukrainian People's Republic gained independence after the first Russian Revolution in 1917, he retook the country the next year and expanded it's territory, making it an artificial state in the style of the EU. When splitting the Transcaucasian republics in 1922, he gave the Armenian territory of Nagorno-Karabakh to Azerbaijan. 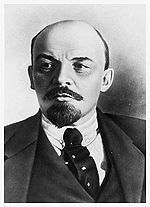 In addition, Lenin and his Bolshevik followers created Central Asian republics, some of which never existed before, like Kazakhstan, gave them many Russian lands that did not belong to them, like Orenburg and other territories populated by Ural Cossacks and provided for building their infrastructure, hospitals, schools etc., by those in the Russian workforce, with Russians being qualified specialists. This page was last modified on 21 April 2019, at 19:06. This page has been accessed 85,913 times.